Another "Diner" meal. Southern Style! 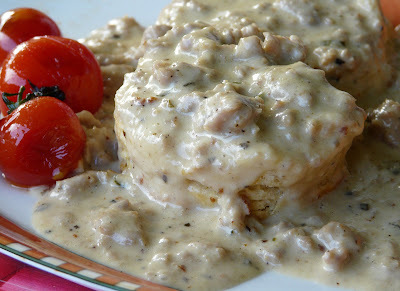 I love biscuits and sausage gravy and have eaten it often for breakfast in restaurants throughout the US. But it isn't something that you will find on a menu in Canada. So when I get a craving for it I have to make it myself. Basic Outline. Again, I don't measure anything. Basic Outline for Sausage Gravy. I never measure any of the ingredients. Remove sausage from casings and saute in oil. Break the sausage up into smaller pieces. When Sausage is brown add minced garlic. Cook for one minute. Add 1 to two tablespoons of flour. Cook for 3 or 4 minutes. Add cream and or milk. Season with salt, lots of fresh ground pepper and minced sage. Simmer for 10 or 15 minutes to meld the flavours. Serve over homemade buttermilk biscuits. I grew up in Ohio where biscuits and sausage gravy are on the menus in most breakfast restaurants. I always try and have a serving of it when I can...thank goodness they don't have it up north or I'd be in real trouble! I've never made it, but you've inspired me...thanks! Just found your great blog with such great recipes...anxious to read all of them. Fantastic looking biscuits with gravy! They are a big favorite of mine. Nice blog, I'll have to peak around and see what other goodies you have in here. That looks so good! I have been wanting to try sausage and biscuits for breakfast.